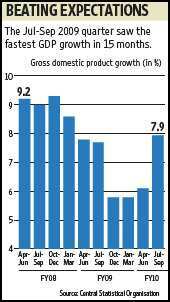 New Delhi: A surprisingly sharp rebound in economic growth in the second quarter of the current fiscal year lifted investor spirits, but is unlikely to encourage policy makers to roll back stimulus measures in a hurry, as growth may lose steam in the third quarter. The economy grew a better than expected 7.9% in the July-September quarter of 2009-10, the fastest in 15 months, reinforcing confidence in a sustained recovery. The bulk of kharif crops get harvested in the current quarter, which is when the full impact of the monsoon failure would show up in the gross domestic product (GDP) data, Sen said. Second quarter GDP growth over the corresponding period of the previous year was 1.6 percentage points higher than the market expectation of 6.3%. The increase is expected to lead to a spate of upward revisions for the full year’s growth forecasts. Following the release of the GDP numbers, Nomura Financial Advisory and Securities (Pte) Ltd, revised its fiscal 2010 GDP growth upwards by a percentage point to 7%. According to economists, market estimates were lower than actual performance on account of agricultural growth being underestimated and the sharp increase in government consumption. Agriculture grew 0.9% in the second quarter as non-food grains are of primary importance in second-quarter GDP calculations. Government expenditure grew 27% in the second quarter to Rs89,169 crore as the impact of some of the last fiscal’s spending announcements, such as Sixth Pay Commission arrears, kicked in. Some of the positives of the second quarter’s GDP growth are expected to taper off in the next quarter, partly on account of the statistical base effect. “This is the last quarter you will see a year-on-year base effect (on government expenditure)," said Samiran Chakraborty, head of India research, Standard Chartered Bank. It was after the second quarter of 2008-09 that a big part of extra government spending took place. Though GDP growth is expected to moderate next quarter, the disaggregated numbers were interpreted positively by economists. According to Sen, “the manufacturing momentum seems to have picked up". 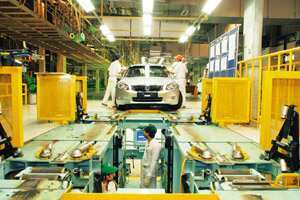 Manufacturing in the second quarter grew 9.2% to record a value of Rs1.32 trillion. Investment, which was the primary driver of economic growth between 2004 and 2008, also recorded higher year-on-year growth in the July-September quarter as compared to the April-June quarter. Gross fixed capital formation (GFCF), which is a proxy for the investment cycle, grew 7.53% in the July-September quarter in relation to the corresponding period of the previous year. GFCF grew 4.10% in the first quarter. Other than the general pick-up in industrial activity which contributed to the growth in GFCF, the delay in the monsoon could have also played a small role. According to Sen, typically, the second quarter sees a slowdown in investment activity as the onset of the monsoon adversely impacts construction activity. In 2009-10, the delay in monsoon might have kept construction going on longer than is normally the case, he said. In the second quarter of 2009-10, GDP was Rs8.34 trillion, marginally higher than the first quarter’s GDP of Rs8.30 trillion. In 2008-09 and 2007-08, GDP in the second quarter was lower than that of the first quarter. Though most economists would have to revise their forecasts upward for the full year, immediate changes to roll back monetary and fiscal stimulus measures are not expected. “A precondition to a full-fledged exit is that it should not compromise the growth momentum that is taking shape," said Rajeev Malik of Macquaire Capital Securities (Singapore) Pte Ltd. “Today’s (Monday’s) GDP report does not change that, as the swing is mainly from agriculture." Echoing the sentiment, Nikhilesh Bhattacharya, associate economist at Moody’s Economy.com, said: “Given the heavy influence of policy stimulus in the third quarter growth numbers, policymakers are unlikely to engage in any immediate action with regards to withdrawing stimulus." Still, Rohini Malkani and Anushka Shah of Citigroup maintained their earlier forecast of a tightening of policy rates by 1.25 percentage points in 2010 by the Reserve Bank of India. The stock markets welcomed the new growth numbers. The bellwether BSE Sensex rose 1.77% to close at 16,926, on a day when other Asian markets, too, gained. “The surprise GDP growth has increased optimism on the industrial economy, bolstered sentiment and improved the medium to long-term outlook for the economy," said Chokkalingam Gangatharan, head of equity research, Barclays Wealth. “The ability of domestic demand drivers has been proved again. If you can get 7.9% growth from about 2-3% (of GDP) stimulus, it gives you confidence in the domestic demand story."